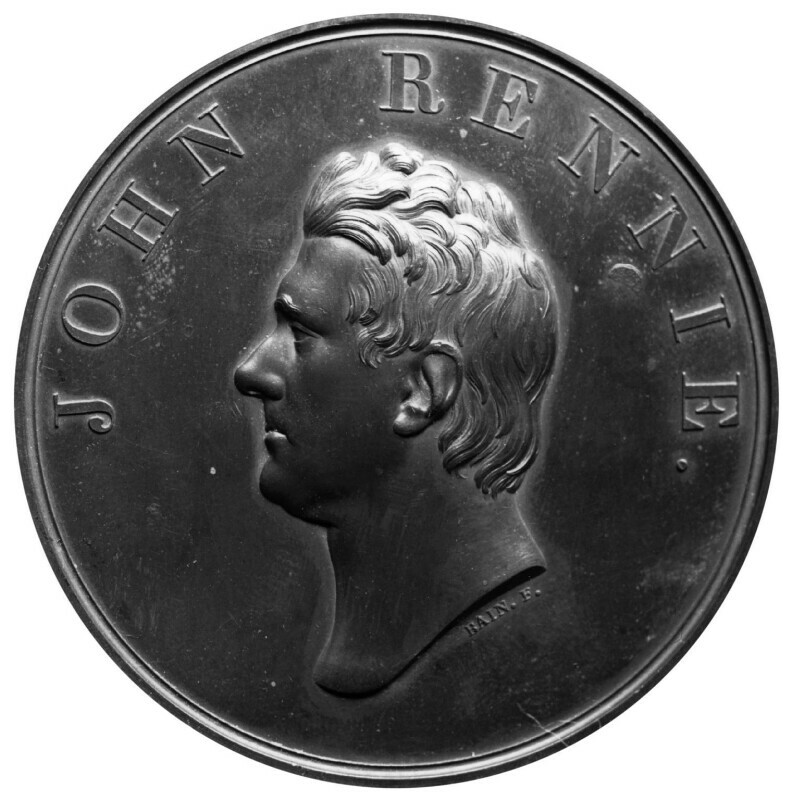 Obverse: profile to left lettered: JOHN RENNIE and signed Bain. f.
Reverse: lettering in laurel wreath, * * * * * Crinan & Lancaster/CANALS/London Leith & Sheerness/DOCK Waterloo & Southwark/BRIDGES/Plymouth Howth & Dunleary/HARBOURS/&c. &c. &c.
The profile clearly derives from Chantrey's bust of 1818 (NPG 649) at that time in the Rennie family possession. His son George Rennie, then a clerk of the irons at the Royal Mint, sent Bain a drawing of it: 'Some time ago I made the enclosed sketch from the Bust with a Camera Lucida: perhaps it may be useful in the new Die you are going to engrave. I shall get the Die ready as soon as possible./Yours - George Rennie/ps. please preserve it' (letter addressed to John Bain dated Royal Mint 13 Nov 1822, and drawing, both kindly shown to me by Messrs Spink & Son in April 1983). Variants of Bain's medal appeared with and without drapery, in 1823 with a plan of Sheerness Docks on reverse and in 1825 with a view of London Bridge (Laurence Brown, British Historical Medals, 1980, 62-4, 1219-20, 1253). L. Forrer, Dictionary of British Medallists lists another of 1831. Given by his grandson John Keith Rennie 1883. RA 1823 (1093) with medals of Scott and Canning 'from busts by Francis Chantrey Esq. '; 'London Bridge in Art', Guildhall Art Gallery, 1969 (122).